Nintendo just pushed the Version 4.0.0 update for the Nintendo Switch. The new update adds—among other things—the ability to transfer profiles and save data to another system along with video capture for certain games. Two features oft-requested by the Nintendo community. Video capture and data transfer are notable inclusions in the update given how popular these features are in other systems like the PlayStation 4 and Xbox One. So far the “select games” available for video capture are The Legend of Zelda: Breath of the Wild, ARMS, Mario Kart 8, and Splatoon 2. To capture video, simply hold down the capture button during gameplay. Players can trim the beginning and end of any given clip and post them to social media like, Twitter and Facebook. You can download the update right now by connecting your Switch to the internet and finding the “update” option in the system's settings menu. 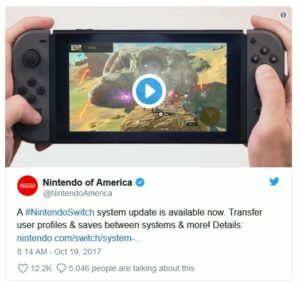 Update: The post has been changed to reflect additional details regarding video capture on the Nintendo Switch.